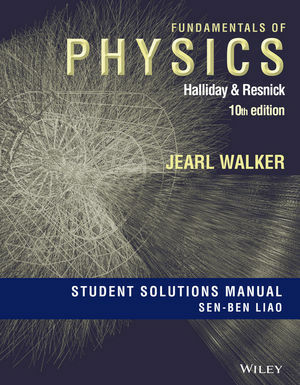 This is the Student Solutions Manual to accompany Fundamentals of Physics, 10th Edition. The 10th edition of Halliday's Fundamentals of Physics, builds upon previous issues by offering several new features and additions. The new edition offers most accurate, extensive and varied set of assessment questions of any course management program in addition to all questions including some form of question assistance including answer specific feedback to facilitate success. The text also offers multimedia presentations (videos and animations) of much of the material that provide an alternative pathway through the material for those who struggle with reading scientific exposition. Furthermore, the book includes math review content in both a self-study module for more in-depth review and also in just-in-time math videos for a quick refresher on a specific topic. The Halliday content is widely accepted as clear, correct, and complete. The end-of-chapters problems are without peer. The new design, which was introduced in 9e continues with 10e, making this new edition of Halliday the most accessible and reader-friendly book on the market. David Halliday is associated with the University of Pittsburgh as Professor Emeritus. As department chair in 1960, he and Robert Resnick collaborated on Physics for Students of Science and Engineering and then on Fundamentals of Physics. Fundamentals is currently in its eighth edition and has since been handed over from Halliday and Resnick to Jearl Walker. Dr. Halliday is retired and resides in Seattle. Robert Resnick is professor emeritus at Rensselaer and the former Edward P. Hamilton Distinguished Professor of Science Education, 1974-93. Together with his co-author David Halliday, he revolutionized physics education with their now famous textbook on general physics, still one of the most highly regarded texts in the field today. Jearl Walker, professor of physics at Cleveland State University, received his BS in physics from MIT in 1967 and his PhD in physics from University of Maryland in 1973. His book The Flying Circus of Physics was published 30 years ago, has been translated into at least 10 languages, and is still being sold world wide. For 16 years he toured his Flying Circus talk throughout the U.S. and Canada, introducing such physics stunts as the bed-of-nails demonstration and the walking-on-hot-coals demonstration to countless physics teachers, who then proceeded to hurt themselves when they repeated the stunts in their own classrooms. These talks led to his PBS television show Kinetic Karnival which ran nationally for years and which earned an Emmy.